This tutorial will teach you how to whiten the teeth of your image in Adobe Photoshop CC using the Dodge Tool and Dodge Tool Settings. 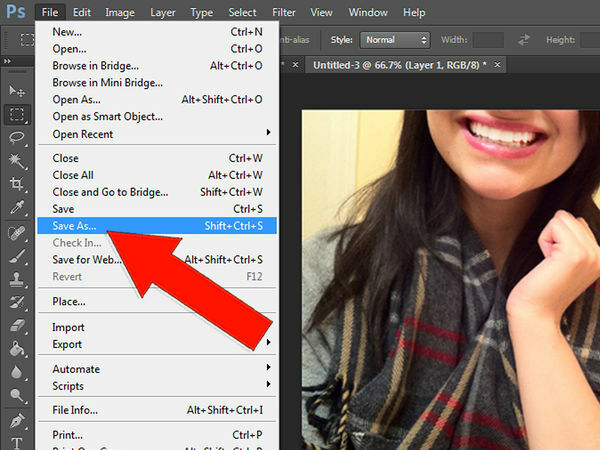 Open Adobe Photoshop CC on your device. Click File > Open and select the image you want to edit. 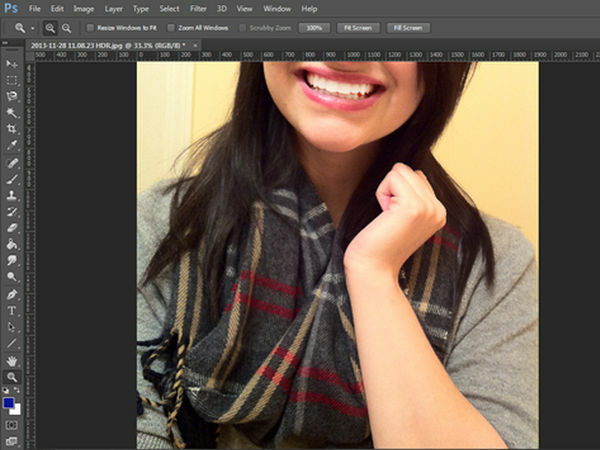 When the image has loaded, use the Zoom Tool in your Tools menu to zoom into the teeth portion of your image.This way, you can focus on what piece of the image you are editing. Select the Dodge Tool from your Tools and locate the tool's settings panel. The settings panel is located at the top of the screen, beneath your main menu that includes File, Edit, etc. In the navigation bar, adjust the brush size to match the size of your second largest tooth (114 for this image), set your Range to Midtones, and place your Exposure to about 40%. Make sure your Airbrush Style is not selected, but Protect Tones is selected. Deselect Pressure for Size icon. Using your Dodge Tool, start from one side of the teeth and click across to the other side. Because your Exposure is set to 40%, you can click the same spot multiple times to increase its lightness. This will help you control which portions of the teeth need to be the least lightened (the corners of your mouth) and which need to be the most lightened (your front teeth). Zoom out from your image using the Zoom Tool set on Zoom Out in the top horizontal navigation bar. Evaluate your image to see if your teeth blend naturally with your image. 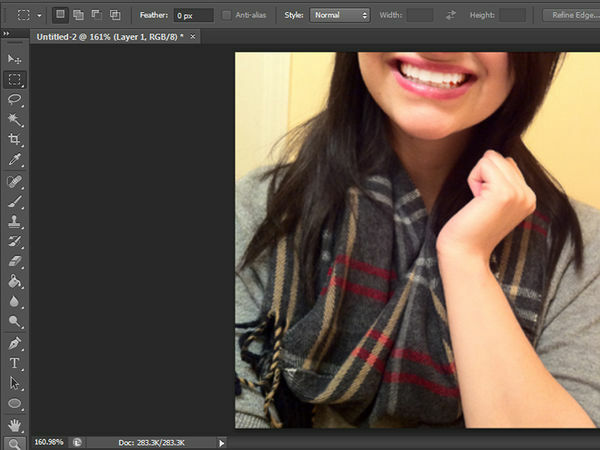 If the teeth are too white or not white enough, you can click Edit > Step Backwards until you have your original image. You can then adjust the Exposure of the Dodge Tool in the Dodge Tool Settings as shown earlier. The higher you set the Exposure, the lighter the effect will be. When you are satisfied with your image, click File > Save As and name your image.